Today's post is courtesy of our friend Linda Dini Jenkins. Linda is a freelance writer and photographer and blogs about travel at www.travelthewriteway.com. She plans small group tours to Italy and will be going to Abruzzo in July 2015. A few years ago, an Italian-American friend who travels to Italy frequently raved about Abruzzo to me — for many reasons, of course, but most vociferously about the food. He said it was the best in all of Italy, and Abruzzo is not even where his family comes from. I’m pretty sure that is grounds for having your Italian heritage badge revoked. In any case, when I finally arrived in Abruzzo, in the south-central part of Italy, for a week of cooking classes and all the eating and drinking that ensues, I quickly understood what he meant. Traveling from Civitella del Tronto in the north down to Sulmona, the culinary experiences were consistently world class. Steeped in tradition, with regional specialties that include your nonna’s recipes and techniques combined with fresh local ingredients, there is a whole lot of love and pride packed onto every plate. Now that I have an apartment in Sulmona, I am always eager to learn about the “rustico” culinary traditions of my adopted home, where simple ingredients are transformed into feasts for both the eyes and the palate. But when I first came to Sulmona, I knew nothing. For instance, I was quickly corrected about truffles when I mentioned that I had been truffle hunting in Umbria once. “Don’t you know there are more truffles in Abruzzo than in Umbria?” Indeed, I did not. Go to the mercato in Piazza Garibaldi — through the arches of the 13th century aqueduct — any Wednesday or Saturday morning in Sulmona, and you’ll find other surprises. Like red garlic — aglio rosso di Sulmona. Locals say it’s the best garlic in the world. It’s sweeter than the garlic we’re used to stateside, but packs a punch of flavor. Best of all, perhaps, it’s known to be a natural antibiotic. Scapes - Called tolle, or zolla, these are the garlic flower stalks that are picked before the actual bulbs develop, and the picking makes the bulbs grow bigger. 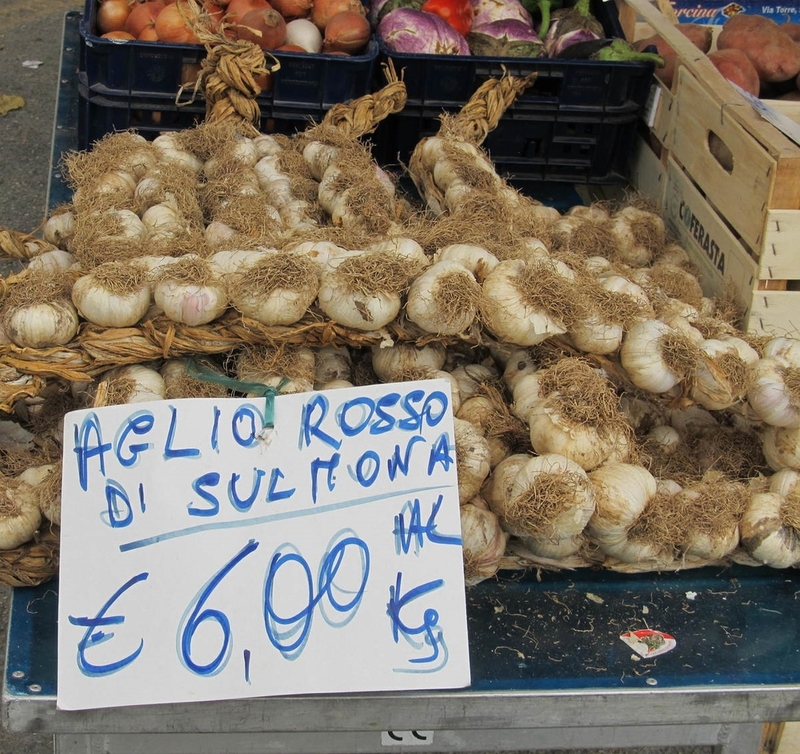 Sulmona is famous for its tasty red garlic and its growers benefit from two harvests: the scapes in May and the bulbs in June. I’ve had the scapes cured in young olive oil and they make an incredible salad or side dish. They are a key ingredient in some pestos and are a flavorful addition to pasta with other seasonal vegetables. Saffron (zafferano) - I always thought of saffron as an Indian spice. But the Navelli Saffron is a gem called red gold — oro rosso. Harvested mid-to-late October from the saffron crocus flower, the stigma are quickly removed by hand and dried, to be used later in a variety of regional recipes. It’s costly because it takes around 150 crocus flowers to produce just one gram of dried saffron. Not to be missed in Sulmona is confetti — candy coated almonds that have been a tradition here since the 1500s, when cane sugar was introduced to Europe. Every color is for a different event — birthdays, Christenings, anniversaries, Baptisms, showers and more. And while most confetti still starts with a Sicilan almond called pizzuta di Avola, some feature hazelnuts, chocolate, limoncello or candied fruit, with more varieties being added all the time. And while you can’t avoid confetti, since it’s displayed outside almost every shop on the corso, a visit to the Pelino or William DiCarlo store is a must when you’re in Sulmona. Lentils are also big in Sulmona and especially, in nearby Santo Stefano di Sessanio. Well, actually, they’re very small. The tiny historic lentils of the region, called lenticchie, are used in hearty soups and stews and are a mainstay in many of Europe’s finest kitchens. They are delicate yet flavorful and not at all “mealy,” like many of the larger lentil varieties. I was so lucky to try Nonna Aida’s wonderful lentil soup last fall when I visited Santo Stefano with some friends from Sulmona. These gourmet gems are harvested in August and into early autumn, where they are then cleaned by hand. It’s painstaking work, and you’ll never look at a lentil the same way again. This is sheep country, so the cheese selection is especially tangy and wonderful. The sheep milk ricotta, called Cacioricotta Abruzzese, is usually reserved for feast days, and is flavored with coffee and lemon zest. You probably know the pungent and flavorful Pecorino d’Abruzzo, which only gets better as it ages. Then there’s Scamorza — a smooth buttery cheese like mozzarella, which is delicious grilled (alla spiedo). Cacio e Pepe (cheese and pepper pasta) is one of my favorite dishes, and it can be found in abundance in Sulmona. This heavenly combination of black pepper and pasta, featuring a hearty, creamy Pecorino Romano cheese sauce, will make even the pickiest eaters smile. Three simple ingredients make for a taste of heaven. Spaghetti alla chitarra is another Abruzzese specialty, and Sulmona delivers it up beautifully. You might hear it called pasta alla chitarra or maccheroni alla chitarra, but the result is the same: thin sheets of kneaded and rested pasta placed on a wooden contraption with steel strings that looks a bit like a guitar (chitarra). The dough is then rolled out with a rolling pin using lots of pressure, where it eventually falls through the strings. It’s a little square and very tasty when served up the traditional way, with a lamb, pork and veal ragu. And speaking of meat, because of Sulmona’s geographic position in the transhumance — the important sheep herding trail that runs from L’Aquila to Foggia — lamb is found in abundance. I don’t eat it myself, but those who do tell me it is a miracle here. I do eat pork, however, and the prosciutto, salumi and salsicce in this area are fantastic. Try the two kinds of pork fegato (sweet and hot liver) and the very regional salame di pecora, salami from sheep’s milk. Of course, it wouldn’t be Italy without wine, and you can find excellent wines in Sulmona, from the popular Montepulciano d’Abruzzo (red) and Trebbiano d’Abruzzo (white) to the lovely fruity but dry Cerasuolo. At the wonderful Locanda Da Gino in Sulmona, we were introduced to another white wine, called Pecorino, which is very local and which almost made us weep it was so good. If it’s worth growing and harvesting, it seems, it’s worth celebrating. There are festivals (sagras) for polenta, cherries, artichokes, wine, lentils, bread, pecorino and more throughout the year. Less than two hours’ drive east of Rome, Sulmona is a foodie paradise.